Orchards are starting to become rare in Kent, and an orchard of half standard mature apple trees is most unusual (possibly unique). Several verities including Discovery, Bramley and Laxton are planted interspersed with the occasional crab apple for pollination. Many of the trees are in good condition and our task was early summer pruning on Bramleys which haven't seen a pruning saw for 7 or 8 years. A before and after shot of possibly the biggest tree in the orchard. Hedge-laying is a skilled job requiring patience and stamina especially when the hedge is extensively overgrown. Here Hawthorne up to 5m (15)ft tall was being layed to restore an old hedge between woodland and orchards. A small party enjoyed the glorious autumn sun on a frosty November morning. First three volunteers share the axe work on a large tree! to cut the pleach. The pleach which is cut to form a hinge on which the bush is laid down is clearly shown in the picture below. Finally the tree is laid horizontal and supported while stakes are driven in to hold it in place. Before any hedge laying can commence the materials need to be harvested. 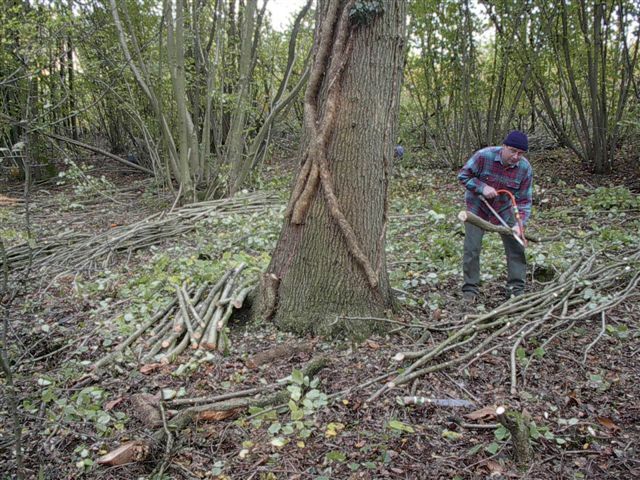 Hazel stakes and binders are produced by coppicing hazel on a seven year cycle. Stakes are 2m (6-7ft) and vary between 50-80 mm (2-3 inches) in diameter, binders are 4-6m (12-18ft) long and whippy enough to be woven between the stakes to hold the cut hedge firmly in place. The ancient art of coppicing hazel stools to harvest stakes and binders for our next task. 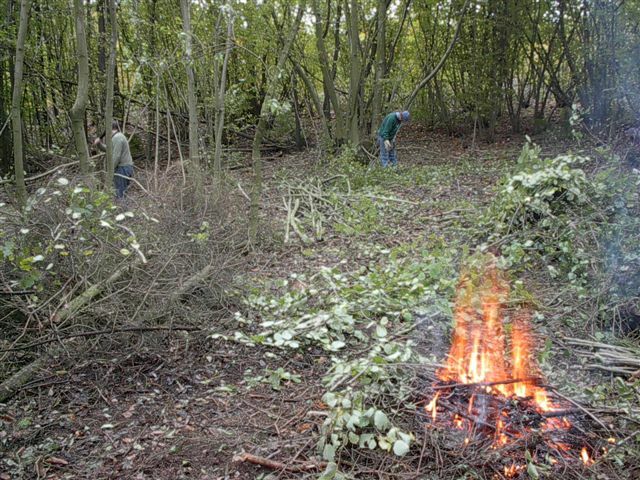 Coppicing means that all the growth on each 'stool' is cut down to just above ground level thereby encouraging new growth to sprout from the base of the tree. This cycle of cutting and regrowing can be continued for many years, even centuries. Depending upon the type of end product that is required cutting is carried out with intervals of 7-15 years between cuts . The aim of this task was to produce enough 6' stakes and 15' binders to provide materials for the Group's hedgelaying task in a fortnights time. In addition we were looking for hurdle rods that would be useful to local hurdle-makers. Anything that was not suitable was put to one side for possible charcoal making sometime in the future and only the tops and some deadwood was burnt.